Top-Rated SellerGulfcoastBoutique consistently earns high ratings from buyers thanks to fast shipping and excellent service. Premium SellerGulfcoastBoutique has been a Paused member on Bonanza since March 09, 2018. Most items have a 14-day money back guarantee. Items with a no-return policy will be specified in the item description. 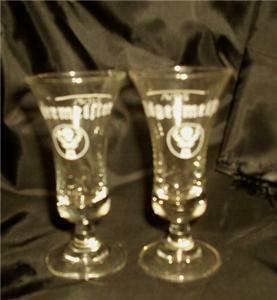 JAGERMEILTER FOOTED SHOT GLASSES SET OF 2 COLLECTIBLE The listing is for a set of two (2) Jagermeilter footed shot glasses. Measure line shows 2 cl. Each glass measures 3 3/4" tall x 3/4" across top. No chips or cracks. Very good condition. Add to your collection. We do offer combined shipping on multiple purchases. Just email us once you have completed your shopping and we will send an invoice with your shipping discounts. We do welcome international buyers. Join our Unique Buyers club. Gulfcoast Unique Boutique guarantees a unique and delightful shopping experience or your money back. Sign up for our newsletters to receive notices about Store Sales and New Items and Useful Tips. Add me to your Favorite Sellers Check out our other Pottery Glass Collectibles and Dinnerware Serving Pieces categories. View My Other Items For Sale Certain images and/or photos used in this template are the copyrighted property of Macmillan digital publishing USA and are used with permission.